The future for a handful of players on the Dallas Stars is incredibly murky. One thing that is clear is they will be participating in the postseason after a dominant performance against the Chicago Blackhawks on Tuesday night. They scored six goals on their way to clinching a playoff spot over the Blackhawks. Four of those goals were scored by players who will be unrestricted free agents after this season and their future with the Stars is very uncertain. If you’re Dallas, you’ve got a good problem to have in the upcoming offseason. Your unrestricted free agents played well for you but you have a wealth of talent waiting for their shot. Many of them have gotten that shot this season and look poised to take on a full-time role in the NHL next season. If you’re one of the impending unrestricted free agents, you have to think this is your last ride with a really good team. You know there might not be room or money for you as a Star next season. You’d love to sign with a contender but the salary cap is potentially going to make that difficult. It could be your last chance for a long time at a deep playoff run. So you’re going to do everything in your power to make that ride go as long as possible. They may not be the biggest names, but the Stars’ impending UFAs are making a lot of noise to close out the season. Who are they? The Dallas Stars have four defensemen who will be unrestricted free agents when July 1st hits. One of them, Jason Demers, will be out for at least the next six weeks with a shoulder injury. 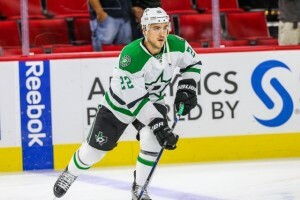 With the emergence of Stephen Johns, combined with the injury and the price tag Demers will command, we may have seen the last of Demers in a Dallas uniform. More on that another time. Alex Goligoski is the big name on the list of impending UFA’s. He’s making $4.6 million against the cap right now and will likely see a raise to at least $5.5 million per season. With the stockpile of talented left-handed defenseman waiting in the press box and the AHL, Goligoski could very well be on his way out. 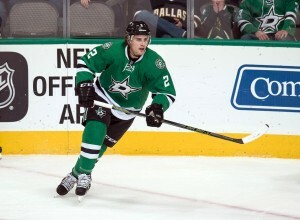 If he does go, the Stars will be losing one of the best defenseman they have had in quite some time. Goligoski has really only gotten significant attention in Dallas when he does something poorly. He makes some mistakes with the puck but when you have the puck as often as Goligoski does, some mistakes are to be expected. Much like Trevor Daley late in his career in Dallas, Goligoski is being asked to a fill a role that is probably just a bit beyond his skill-set. He’s expected to play like a number-one defenseman when in reality he is likely a low-end two or a high-end three. He’s done well filling any role Dallas has asked of him, which has been a lot. It would be sad to see him go but I think it’s likely this is his last run in Dallas. Jordie Benn is an interesting case. Obviously he is the brother of captain Jamie Benn so there is one immediate reason to keep Jordie around. While he has been one of worst possession players on Dallas this season, he is a rare left-handed defenseman who is comfortable playing on the right side. In that case, Benn could be a useful seventh-defenseman to have around when injuries occur throughout the season. He wouldn’t cost much to keep around and you could make a case for or against bringing him back. He will be useful in the postseason. Depth is key and with Demers already looking like he will miss at least a round of the postseason, Benn could potentially have an opportunity to step up and make a difference. Kris Russell hasn’t been in Dallas long enough to foresee a possible extension or departure so I won’t go into that. Jim Nill paid a high-price to bring him to Dallas and many, including myself, did not agree with the price paid. He was a horrendous possession player in Calgary but has actually played solid so far in Dallas. He has still been on the negative end of even-strength CorsiFor% with a -0.28 CorsiFor% relative to when he is off the ice. Still, he’s played in just nine games and is eating a ton of minutes. He would likely be more effective with his minutes dialed back a bit but the injuries to Demers and John Klingberg forced Russell to immediately start logging minutes. All things considered, he’s been alright. He’s looking to prove the Corsi-people wrong and earn himself a big contract. He’s appeared in just 24 playoff games in his ten NHL seasons and will be looking to show everyone what he’s got. He has already shown to be a fierce competitor on the Stars’ blue-line. There is a very real possibility that all of the pending UFA forwards on the Dallas Stars will be pushed out when July 1st rolls around. 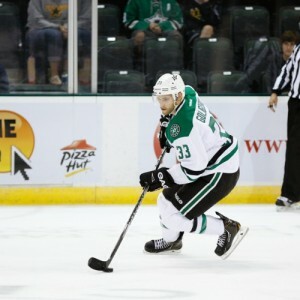 It’s certainly no knock against them, it speaks to the tremendous depth that the Stars have in the AHL. Travis Moen is almost certainly gone. He’s chipped in two assists in just 20 games and really hasn’t made a significant impact on the team. I’d be surprised to see him appear at all in the postseason and I’d be even more surprised to see him receive another contract in Dallas. He’s played admirably but he just doesn’t fit the play-style of the Dallas Stars. Dallas Stars center Colton Sceviour (22) during the NHL game between the Dallas Stars and the Carolina Hurricanes at the PNC Arena. Colton Sceviour is really starting to hit the jets as the regular season comes to a close. He has scored five of his ten goals in his last 11 games played. When the Stars made the playoffs two seasons ago, he had a similar run to finish out the season. He’s a perfect fourth-line player in that he kills penalties and can chip in a fair bit of offense. He knows that his job is on the line and he has been playing like that for the past month. Although he has once again missed significant time with injuries, Patrick Eaves makes quite the impact when he is on the ice. He’s scored nine times in 47 games this season but it feels like he has scored a lot more. He had a first period hat trick against the Blackhawks not long ago. He works well on the top power play unit. He can fit anywhere from the fourth-line to the top-line playing with Benn and Seguin. It might be his last chance to make an impression in Dallas and he’s taking full advantage by cashing in on his scoring chances. Finally we arrive at Vernon Fiddler, the penalty-kill-captain of the team and a guy who we know wants to finish out his time in Dallas with a Stanley Cup. Here is a quote from Fiddler to the Dallas Morning News when he re-signed in Dallas for two years in July of 2014. He’s doing what he can to make that happen. Fiddler has scored 12 goals this season, just one back of the career-high 13 he set last season. He is certainly anxious to show the Stars and the rest of the league that he can still play in the postseason. When it comes to many of the pending UFA’s, it isn’t always the price-tag that may force them out. It is the young players who are ready to take control. Fiddler, Sceviour, and Eaves could all easily be re-signed at a reasonable price, but at what cost to the development of players who have clearly surpassed the AHL-level? Radek Faksa has been given a long audition this season and looks primed to take Fiddler’s spot at the very least (look out Cody Eakin). Brett Ritchie is a physical player who can score and could step in easily for Eaves or Sceviour. Same thing goes for Curtis McKenzie. Johns is a defenseman who looks like he could potentially take Demers’ spot. With players such as Esa Lindell, Jamie Oleksiak and Patrik Nemeth coming on strong, does that make Goligoski expendable? Answers to the questions and doubt will come after the upcoming playoff run. For these free-agents-to-be, they hope that is going to be a long, fun ride.